SLAVIANSK Ukraine (Reuters) - Ukrainian forces routed pro-Russian rebels in a flashpoint area of eastern Ukraine on Saturday and raised the country's blue and yellow flag again over what had for months been the separatist redoubt of Slaviansk. 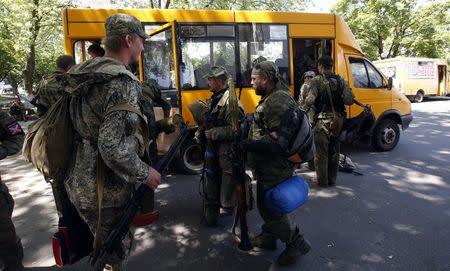 About 100-150 Ukrainian troops patrolled the centre of Slaviansk and some soldiers were bringing out weapons and ammunition from one of the administration buildings the rebels had been using as a headquarters. Shooting could be heard from the outskirts of the town which had served as a stronghold for rebel forces command, and one Ukrainian soldier said the city was not yet fully under government control. Newly-appointed Defence Minister Valery Heletey appeared confident in reporting to Ukrainian President Petro Poroshenko. "Your order to free Slaviansk from the (separatist) fighters has been carried out," he was quoted as saying on the presidential website. The rebellion in largely Russian-speaking eastern Ukraine has been a source of great tensions between the West and Russia. Moscow, which has already come under economic sanctions, denies Western accusations it has been backing the insurrection possibly with a view to dismembering the former Soviet republic. Heletey said the Ukrainian flag had been hoisted over the main administrative building in Slaviansk, replacing the Russian white-blue-red tricolor separatists had hoisted in early April when they seized key buildings in the city of 130,000. Interior Minister Arsen Avakov said a large number of separatists had fled in the face of sustained fire from Ukrainian forces. "A significant number of militants have left Slaviansk ... along the way, our battle groups are greeting them. They are suffering losses and surrendering," he said in a statement on his Facebook page. A source close to the rebels told Reuters they had been outnumbered by 50 to one. "(The Ukrainian forces) have greater numbers of troops and military hardware," the source said, speaking on condition of anonymity. The rebels acknowledged the loss. Aleksandr Borodai, a leader of the self-proclaimed Donetsk People's Republic, was quoted by the Interfax news agency as saying: "The punitive forces of Ukraine ... moved into a large-scale offensive. "Given the disproportionate numerical superiority of the enemy troops, units of the armed forces of the Donetsk People's Republic were forced to leave their previous positions on the northern sector of the front." Slaviansk has been the strongest redoubt of militants fighting government forces in eastern Ukraine. Its re-capture represents Kiev's most notable military victory in three months of fighting in which more than 200 Ukrainian troops have been killed as well as hundreds of civilians and rebels. On Saturday evening, a white flag with the St George's ribbon on it - one of the standards of the self-declared Donetsk People's Republic - lay on the ground in front of one of the main buildings used by the rebels. Soldiers brought out crates of ammunition and several shoulder-carried grenade launchers and rocket launchers of a type often used against tanks. A group of about 15 men in civilian clothes lined up near Ukrainian soldiers and were accompanied by police though it was not clear if they were formally under arrest. "We came here early this morning and those that were here opened fire rather stupidly because of information they have received about us. The town is not yet fully under our control," said one Ukrainian soldier who did not wish to be identified. Alla Belousova, who lives in Kramatorsk in the eastern industrial Donbass region, expressed disappointment with Russian President Vladimir Putin. "Pass on these words to Putin: the people of the Donbass believed him for some reason when he said he would help. But now they (government forces) are killing peaceful civilians and if that is not genocide I would like to know what is. "The (rebel) fighters are without shoes and don't have anything to fight with, she said. Poroshenko's website said separatist fighters had come under mortar fire as they tried to break through government forces' lines. The separatists had lost one tank and other armoured vehicles, the statement said. A Ukrainian paratrooper, Eduard, who was at an army checkpoint going into Slaviansk said: "It was a quiet night when suddenly a column of separatists appeared and began firing. They didn't have much luck. Artillery guns hit part of the town and part of those here." "All those (separatists) who got to this checkpoint were killed. Those who were over there ran away," he said, gesturing higher up the road. Some of the rebels appeared to have moved to Kramatorsk but they were pulling out of there quickly on Saturday apparently fearing air strikes from Ukrainian planes overhead. People in the town said they had begun to pull out around 4 a.m. and about 100 of them had left the town. Uprisings in eastern Ukraine erupted in April as rebels took over state buildings, built a powerful arsenal of seized weapons and declared their independence from Kiev, calling the pro-European government illegitimate. Talks in Berlin last week involving the foreign ministers of Ukraine, Russia, Germany and France had set Saturday as the day for talks between a "contact group" representing Ukraine, Russia and the OSCE security watchdog, and separatist leaders. The talks were to have been aimed at working out an effective ceasefire observed by the opposing sides. Poroshenko declared a week-long unilateral ceasefire on June 20 which he renewed for a further three days. But he refused last Monday to extend it any further, citing numerous violations by the rebels, and sent government forces onto an offensive against the rebels. Russia has denied allegations by Kiev that it has been fanning the separatist rebellions by allowing weapons and fighters to cross over the long joint border to support the separatists. It has been pressing Poroshenko to engage in talks with the separatists and agree on a ceasefire. Poroshenko said on Friday he had suggested a time and venue for the "contact group" to meet on Saturday. But given the sudden change in military dynamics in the region the meeting appeared now to be in question. Slaviansk became a hotbed of resistance under the military command of Igor Strelkov, a Muscovite appointed as defence minister of the self-declared Donetsk People's Republic. It had increasingly appeared to be going its own way independently of the rebel groups controlling Donetsk, the main industrial hub, and Luhansk. Many of the rebel violations of a government ceasefire which expired last Monday appeared to come from Slaviansk. But on Friday, Strelkov made an impassioned appeal for help to Russia, whom Kiev accuses of fanning the violence. He said without Moscow's aid the region the rebels lay claim to, known as Novorossiya (New Russia), would fall to Kiev's forces. "Slaviansk will fall earlier than the rest," he wrote on a rebel website.